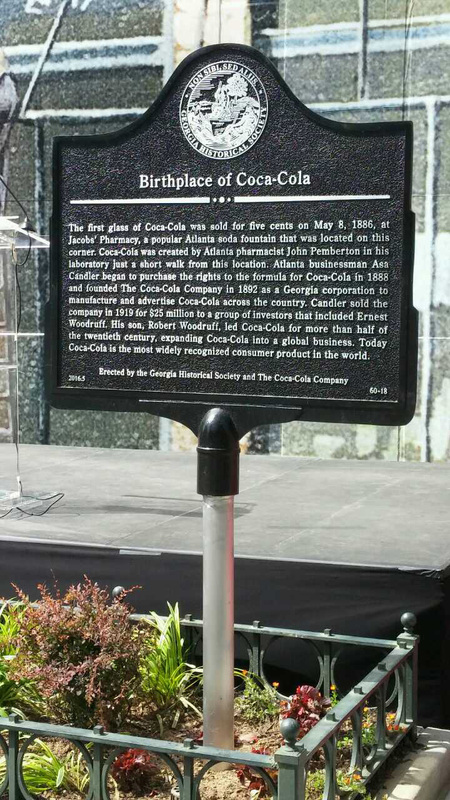 Marker Text: The first glass of Coca-Cola was sold for five cents on May 8, 1886, at Jacobs’ Pharmacy, a popular Atlanta soda fountain that was located on this corner. 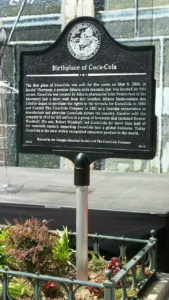 Coca-Cola was created by Atlanta pharmacist John Pemberton in his laboratory just a short walk from this location. Atlanta businessman Asa Candler began to purchase the rights to the formula for Coca-Cola in 1888 and founded The Coca-Cola Company in 1892 as a Georgia corporation to manufacture and advertise Coca-Cola across the country. Candler sold the company in 1919 for $25 million to a group of investors that included Ernest Woodruff. His son, Robert Woodruff, led Coca-Cola for more than half of the twentieth century, expanding Coca-Cola into a global business. Today Coca-Cola is the most widely recognized consumer product in the world.